Bora Bora, a huge lagoon with an island dominating it at the center, is famous as one of the Pacific’s most beautiful island. An extremely impressive array of dives against the attractive background ofunique volcanic peaks is provided by the lagoon and the coral reef that surrounds it. For more than 40 years, the island has catered to vacationers and tourists alike. It is also recognized as the world’s most beautiful places for scuba diving, and for this very reason Bora Bora diving has become so renowned. Diving in Bora Bora is absolutely heavenly because of its most spotless lagoon. Diving is Bora Bora is considered a “must do” by professional divers who happen to visit the island quite often. Not even an amateur diver, let alone professionals, can turn their back the experience of diving with groups of giant manta ray and schools black-tip reef sharks. Beginner coral garden dives, drift-through-the-pass dives, manta ray dives, and shark dives are the most popular dives in Bora Bora. It is possible to get to any of the popular Bora Bora diving spots with a quick trip since it is a small island. What can be seen while diving in Bora Bora? Bora Bora is well-known for its shark dives. Various species of shark live in these French Polynesian waters, such as the black-tip reef sharks, gray sharks, hammerhead sharks, lemon sharks and white-tip sharks. Usually, on a single dive, divers spot hundreds of sharks of multiple species. 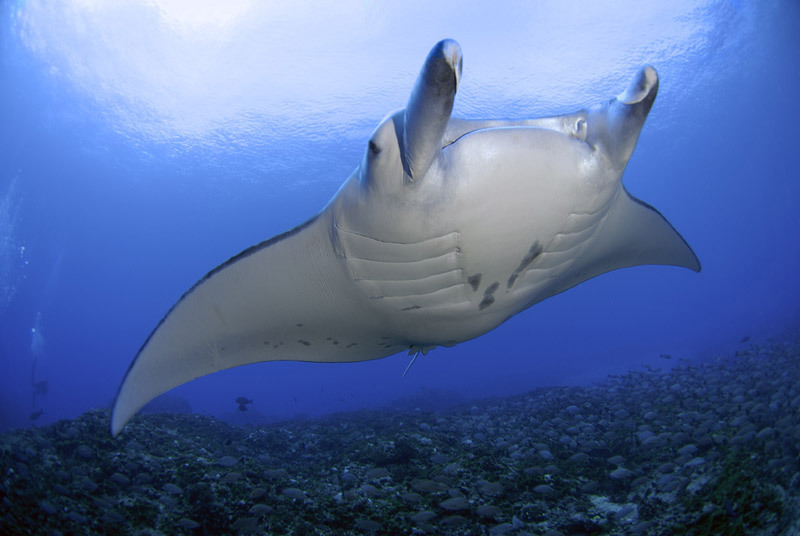 Inside Bora Bora’s lagoon, divers get the chance to dive with elegant manta rays. Even divers who have minimal experience can dive in with the manta rays at this Bora Bora diving spot because of the water conditions. Bora Bora’s lagoon is home to bat rays, eagle rays, leopard rays and sting rays as well. It is quite amazing to witness large schools of these rays gliding along. Seasonally, in between July and November, humpback whales pass through these quiet waters; divers who dive during these months get to encounter these giants. Diving conditions in Bora Bora are idea throughout the year. The water temperature remains warm all-year round, with an average of 84°F in summer and 79°F in winter. Diving skins or a 1/8 inch wetsuit is enough to protect divers while diving in Bora Bora at any time. French Polynesian waters in Bora Bora are very clear with more than 100 feet of visibility. One of the ideal snorkeling spots in Bora Bora is right above a 130 feet dive site where the sharks and divers swimming along the sea bed at the bottom can be clearly seen. At times, dolphins can also be seen swimming in the distance. Various cruise charter companies are available in Bora Bora for those in search of a dive vacation. Thus, it is apparent that the diving opportunities are the star attraction of Bora Bora, along with the diverse marine life and scenic surrounding. The experience of Bora Bora diving can truly not be matched!